Chances are, you have already seen sitelinks, but just didn’t know what they are called. 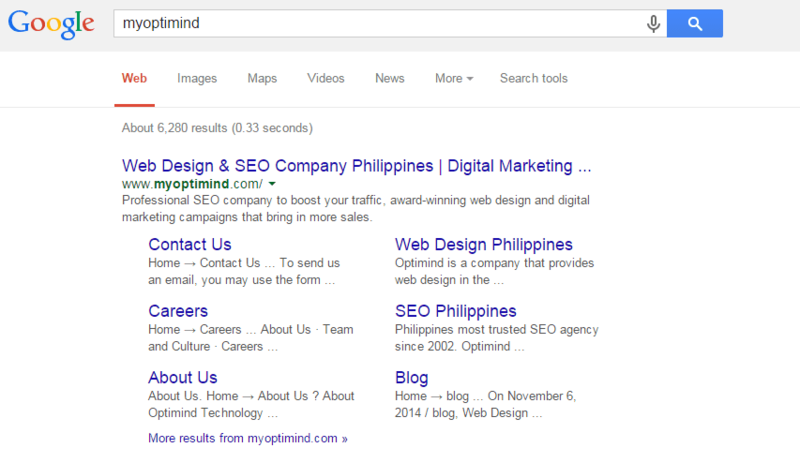 Any digital agency Philippines would refer to a sitelink as a particular listing format on the search engine results page (SERP). When you search for your brand, for instance, Google will serve not just your homepage, but also some targeted internal pages. These sub-pages are typically indented and organized into a maximum of two columns. See below. The main purpose Google is serving sitelinks to users is helping them navigate the site. Sitelinks are displayed for navigational and branded queries (queries that include your brand name) only although Google may choose to serve them if it rules out that showing the links is necessary. Based on the example above, the user is searching for ‘myoptimind’ and is probably trying to access our domain (myoptimind.com). Google recognizes the intent behind the inquiry, so it served the user not just myoptimind.com, but also some relevant sub-pages that the user may want to visit directly. Unfortunately, website owners themselves cannot add sitelinks. Google adds these links based on its own algorithms. However, you can create campaigns using Google AdWords for creating sitelinks on the ad group level. If you deemed the Google-added sitelinks are not giving any value to your site, you may choose to block the sitelinks individually. Website owners may also choose to demote a sitelink or sitelinks. Google puts between three and eight sub-pages per website. Sitelinks with 15 characters and less seemed to perform best. While you may think that having sitelinks have very few direct benefits, think again. John I. Jerkovic, author of SEO Warrior, claims that having sitelinks must be desired and strived to. First, it implies web presence and second, it implies authority. And third, sitelinks occupy a great amount of screen real estate on any given SERP. The more sitelinks you have, the farther your competitors’ sites are pushed down. Evidently, sitelinks can be considered as an important metric in determining the trustworthiness of a website. In deciding which sitelinks will be displayed, Google relies on user behavior. An example of a signal is the number of times a particular page is accessed by the users and the length of time the users spent on that page. Of course, the content of the page is another strong signal. Now, the question is how important sitelinks are for search engine optimization (SEO)? We design and build our websites with one thing in mind – the users. Thereby, sitelinks, which make navigation easier, are geared toward providing the users with highly satisfactory overall user experience. These are informed suggestion created by Google, so that your users need not sift through your site upon landing on your homepage. Giving the best results in the shortest time possible will save time on the part of your users. Now, the bigger question is how can you encourage Google to show your sitelinks? However, there are several signals that you can take advantage of. Also, there are industry best practices that you can utilize to increase your chance of having sitelinks displayed under your domain. Below are some general guidelines. Websites rank more for navigational searches because their names set them apart from generic searches. Nonetheless, if your brand name is already unique and has brand recall, then just create a website that reflects the uniqueness. For example, our company name is Optimind Technology Solutions and our domain name is myoptimind.com. Websites should be crawlable, and one way of making your website spider-friendly is by making it flow logically. You should start with your navigation bar wherein it must point to important sections of the site. For one, the site structure must be intuitive to the users. They should know which and where to click next, so they will find what they are looking for. Google views relevance, in this sense, as the synergy between page titles and the page contents. Google will look at the page title first, which is still an extremely important on-page SEO element. Page titles must be descriptive and succinct. Not just for the crawlability of your website, but also for alerting Google that your site has a new content. As such, a sitemap increases the likelihood of having targeted sitelinks. Better submit your sitemap to Google Webmaster Tools to further facilitate crawling. Web sites must publish content on a consistent basis. Rand Fishkin of MOZ, however, noted that it takes more than publishing unique contents. Instead, the content must provide unique value to the users. So, write and publish information-rich contents that your users will find useful and relevant. Make sure that your navigational pages (About Us, Contact Us, etc.) contain solid contents otherwise Google spiders will only dismiss them and may not regard them as a relevant sitelink. Perhaps, Google displays your sitelinks because a user searches for your brand wherein you should appear in the first position in SERP. Personally, I have never seen a SERP that has sitelinks for the #2 result. So, strive to be at #1 – be it for a branded or non-branded query. Evidently, getting sitelinks is not without difficulties. It requires hard work and getting yourself acquainted with the best practices. Nonetheless, the rewards are great including, but are not limited to, higher organic traffic, higher CTRs, more qualified leads, higher conversion rates and of course, greater trustworthiness and better user experience.